Birdwatching is a hugely rewarding and enjoyable pastime; from bringing further enjoyment to a walk in the countryside, through to a life-long career. Being able to identify the birds that you see and hear about you greatly increases your connection with nature and enables you to give something back and make a real, direct difference for conservation by making a note of your sightings through one of the many BTO surveys on offer. We take you through all stages: from learning to identify common birds by sight, to increasing your repertoire of species, then on to identification by sound. We provide a series of free online videos to help separate confusion species (see here), and then help you to take your birdwatching to the next level by discovering what is involved in surveys and offering survey-specific workshops to hone your skills to perfection. 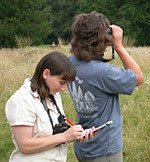 We also offer professional and bespoke bird ID and bird surveying training. There is a survey for everyone, regardless of your level of experience, bird identification skill and confidence and so all of our courses and workshops, including bird ID ones, include sections on surveying and guiding you towards the survey that suits you best. All of our courses comprise indoor taught sessions and outdoor practicals, putting what we have learned into practice. There will be some outdoor elements regardless of the time of year/weather. You do not have to be a BTO member to attend a course, workshop or to take part in a BTO survey. Our 2½-day residential courses are based at a range of stunningly located centres around the country, which vary from year to year. These make ideal venues, allowing valuable practical experience in beautiful, bird-rich areas. The extra time available on residential courses allows us to look in more depth at the topics we are covering and have much longer practical sessions in the field to practice what we have learned and to encounter a wider range of species and habitats and to enjoy the social side of learning with ease. These courses include full board from supper on the first night, breakfast, lunch and supper on the second day, and breakfast and lunch on the final day. Accommodation for two nights is also included in the price and offers excellent value for money. Our 1-day workshops usually run from 10am until mid-afternoon (c. 4.30pm), although timings may vary for coastal-based courses as tide times can dictate different start/finish times. Indoor theory and brief outdoor practical sessions help everyone to understand the topics covered and to get some helpful practical experience. The price does include tea and coffee, but participants are asked to bring a packed lunch. Each venue does vary and some offer a café facility; we will let you know what the situation is with each venue when you book. All courses are led by experienced BTO staff and members, all of whom have extensive experience of BTO surveys and the different methodologies that are used, as well as all being keen and experienced birders and trainers. This combination of skills allows the leaders to gently encourage and direct participants in bird identification and surveying as well as creating a great environment for participants to learn from each other's experiences. Practical sessions are carried out in small groups, so that there is a high level of tutor to participant help. More details on courses, venues and prices.